This is an old Southern recipe that may have those of you raised north of the Mason-Dixon line grabbing your stomachs in disgust, but it's actually quite tasty if you do it right. It's also one of those regional recipes that come in as many different variations as there are cooks who've attempted it, but this is how my grandmother taught me to make it. First, you need a big cast-iron skillet. If you don't have one, you shouldn't be attempting Southern cooking in the first place, so come back after you've acquired one. Second, this works best with thin-to-medium-cut pork chops; thick-cut ones tend not to cook fast enough. Wash the pork chops and pat dry. Mix up the breading with half flour and half bread crumbs, salt, pepper, and whatever spices you feel like throwing in. Beat an egg with some milk. Depending on how many pork chops you're cooking, you want about 1/2 to 3/4 of a cup of Coke. Mix in 2-3 tablespoons of brown sugar and 1-2 tablespoons of Worcestershire sauce, to taste. You're aiming for a nice mix of sweet-tangy-spicy in which all the flavors are having a nice party instead of shouting over one another. If you feel like kicking things up a notch, you can add a drop or three of Tabasco sauce, but don't overdo it—this isn't a Cajun recipe. Heat the skillet over medium-high heat until it's good and hot. Add some cooking oil. 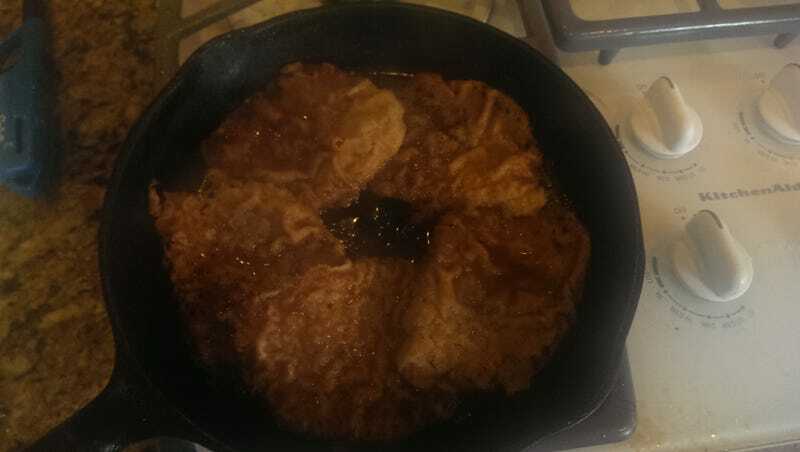 Dredge the pork chops in flour, then dip in the egg mixture, then flop them into the breading, covering both sides. Brown them in the skillet, no more than one minute on each side. They won't be cooked all the way through, but that's okay. Reduce heat to low and add the Coca-Cola sauce, then cover and simmer 10-15 minutes until the pork chops are cooked through and the sauce has been reduced to a nice glaze. There won't be that much sauce left, since the breading will absorb most of it. When you're done, it should look more or less like the photo at the top. Be careful when serving the pork chops up, because the breading will fall apart easily. This isn't the most heart-healthy recipe, but it's not fatal as long you don't cook them in lard like my grandmother told me to. My kids love these because they come out kind of like exotic Chicken McNuggets in pancake syrup.